The holiday season is right around the corner! I’m not certain if I get more work being a dog trainer or being a veterinary technician during this time of year. What I can guarantee is that we will see at least a half dozen toxicity cases before it is all said and done and the holidays are over. 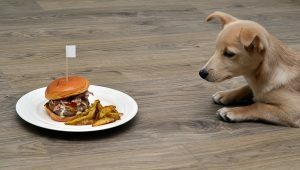 Just because a food is safe for humans, doesn’t mean that it is safe for your pet. Your pet’s metabolism and how certain foods affect him is completely different than how your body metabolizes them. Even cats’ and dogs’ metabolisms can be quite different. Be sure to check and see what is safe for your specific pet. 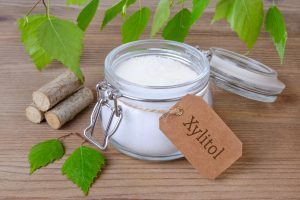 Xylitol, an additive that is often found in sugar-free goods and gum, cannot be digested in the intestines until the body adapts, which doesn’t happen in canines. Even small doses (one or two pieces of sugarless gum with xylitol that are swallowed) can cause hypoglycemia, seizures, liver failure and death. Xylitol is one of the most dangerous toxins to your pet. Grapes and raisins can cause kidney failure even in small doses. 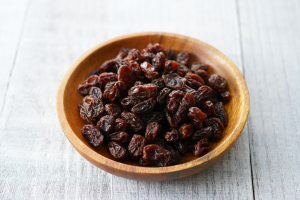 Raisins are even more hazardously toxic because the drying process makes them more potent. If and when I allow raisins in my home, I put them under lock and key, I also never leave grapes on the counter. Grapes are kept in the refrigerator and eaten immediately or disposed of outside. Ironically, we didn’t have this information 20 years ago when I worked at a vet clinic where we often gave the veterinarian’s English Mastiff grapes, at the advice of his owner, because he had such severe allergies. Hopefully, we didn’t unknowingly facilitate an early death. Kidney failure is a very scary condition! Did you know that for your veterinarian to recognize even the earliest signs of kidney failure or kidney disease when your dog’s creatinine levels have increased is that approximately 66% of the total kidney mass is non-functional or has shut down? Symptoms include loss of appetite, increased water consumption, high blood pressure and damage to the eyes. Please do all that you can to avoid clinical signs of kidney failure. This is why it is so important that steps be taken to minimize damage and failure. Thankfully small doses of milk chocolate won’t usually cause your pup an issue except for some vomiting and/or diarrhea and discomfort. In large doses or with very concentrated chocolates (think baking chocolate or powders) only a small amount can be dangerous. Toxic doses of theobromine, the most hazardous substance, and caffeine in chocolate is dangerous to your dog and is estimated to be toxic at 20mg per kg. Be very careful to safeguard your dog from this substance during the holidays, and year-round! Holidays are full of chocolate, chocolate baking, and chocolate treats. Be extra cognizant of the chocolate in your home during these times. Addendum: as I get ready to go to print with this (a few days after Halloween) I had an interesting experience at work just yesterday. 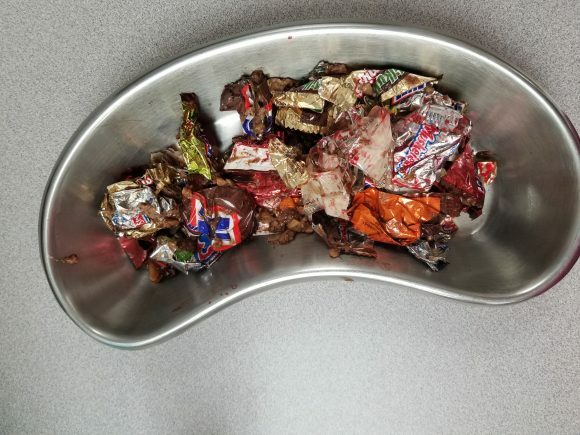 We were called by an owner whose Boston Terrier had consumed some bite-sized Halloween chocolates and their wrappers! The owners weren’t exactly sure how much he had ingested. We did initial x-rays, which were concerning, but we had hope that perhaps after the body had broken down some of the milk chocolate, the wrappers would pass without harm. The dog came in the next day for follow up x-rays so we could see if what we were seeing in the stomach and intestines was moving through his system, which would indicate that his stomach and bowels were not blocked. Unfortunately, the debris had not moved at all. We were forced to do an abdominal obstruction surgery to remove the wrappers from his intestines. I made sure to take pictures so that you could marvel at what we pulled out of this poor guy that day. They really are quiet impressive! This is probably the most expensive and traumatic bag of candy these people have or will ever purchase! Please! Put your candy and dangerous foods away! Macadamia nuts can cause vomiting, ataxia, tremors, increased heart rate, and fever if ingested by your dog. I like to avoid all nuts except peanuts and peanut butter. 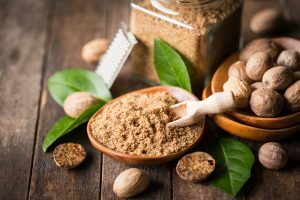 Likewise, nutmeg can also be dangerous. In small doses, it can cause abdominal pain and discomfort, but in large doses, it can cause increased heart rate and seizures. It can also increase body temperature. Be cautious; many holiday baked goods contain nutmeg. Garlic and onions can cause your dog’s red blood cells to function below their ability or to be able to clot as quickly. Hemolytic anemia can be very dangerous and cause lethargy and pale gums. Many dog recipes call for onion powder, garlic powder, or garlic because the people who publish these recipes are ignorant to the damage that these substances can cause. When making your dog treats or snacks, stick with lean protein and leave out any additives like onion, garlic powder, or salt. Even salt can be dangerous to your dog! High salt in large and continuous doses can cause kidney disease. Yeast doughs and other baked goods, when ingested by your dog, can continue to “rise,” can be filled with gases, and become deadly. If you are baking and you let your dough rise, do it behind a closed door where your dog can’t gain access. 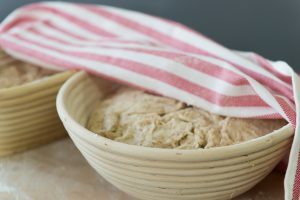 Yeast dough, cinnamon roll doughs and the like can be extremely dangerous yet smell delicious to your dog. Be cautions when handling these things. Also remember that many holiday treats contain chocolate, nutmeg, cinnamon, and other spices that may cause vomiting and diarrhea. Pets are also lactose intolerant, so dairy products aren’t the best idea. In small doses, cheese can be fine. But don’t give your cat a saucer of milk; that is an old wives tale that just creates stomach distress. Do your best to avoid using dairy. Did you know that one of the leading causes of allergies can be cheese? 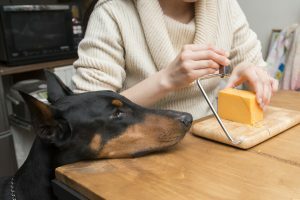 If your dog has allergies and you hide pills in cheese, you can be adding to his distress and misery. Instead of using cheese or dairy, use some peanut butter to hide pills. Dogs are also susceptible to food poisoning. Be careful feeding raw foods! Salmonella can wreak havoc on your dog’s internal system. If you do feed raw, feed fresh, human quality raw. Also, don’t give your dog food that has sat out longer than something you would be willing to eat. Bacteria that live in rotten foods can be toxic to your dog as well! 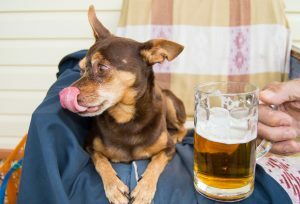 Alcoholic beverages (that’s right – letting him imbibe with you this holiday season may kill him or make him seriously sick) is toxic to dogs. Dog livers do not break down alcohol like human livers can do. I can’t tell you how many people think that giving their dogs alcohol and getting him drunk is humorous. Even if you don’t see death or immediate distress after the initial exposure, the damage has likely been done and will not be repaired. The truth is when our dogs are old, and their systems are failing we would do anything to take back something harmful that we may have originally been ignorant about. If in doubt, don’t do it! It isn’t actually funny. Liver failure is a sad and debilitating disease. Symptoms include loss of appetite, weight loss, vomiting and diarrhea, yellowing or jaundice of the whites of the eyes, tongue, gums, and skin. Likewise, caffeine and caffeinated drinks can be toxic to dogs. Always put your coffees, teas, and energy drinks in places that are impenetrable to your pets. Like drinking alcohol and the later behavior is not entertaining, neither is the behavior and agitation and possible death that caffeine can cause for your dog. Bacon, fatty foods, and other table scraps can cause severe pancreatitis. Our bodies are used to eating fatty foods, and most of us can deal with that well. However, your dog’s body is set up to eat much less processed fats and more lean meats. Even one piece of bacon can cause serious pain, stomach upset, vomiting, and diarrhea that can result in a required hospitalization stay. Some breeds such as Schnauzers and cocker spaniels are even more prone to pancreatitis. Avoid fatty foods and table scraps at all cost. The damage that it can do to your dog, not only his weight but also his internal systems that break down fat can be severe. It is a lot easier to keep bad foods locked up than to worry about what your dog may or may not have ingested. There is no shame in locking up foods that are toxic to dogs. I, personally, don’t even buy anything with xylitol in the ingredients. It just isn’t worth it to keep this dangerous substance in a home where my dogs love food and might make a deadly mistake. Veterinary bills for poisoning can reach thousands of dollars and do permanent damage to your dog’s red blood cells, cause liver and kidney failure. No piece of gum, raisins or bar of baking chocolate is worth a dead or sick pooch! Know your inventory! 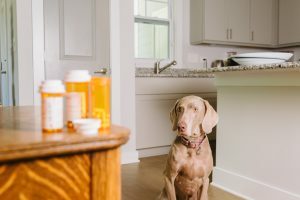 You will want to be able to recognize when something that could be toxic to your pet goes missing, and poison control and your veterinarian will need to know how much was ingested and the approximate time of ingestion. It is best if we can induce early vomiting before the body starts to break down the toxins. However, in some cases with some poisons it is critical not to induce vomiting but instead to use activated charcoal. Unknown vomiting is usually one of the first symptoms of toxic ingestion. Vomiting is the body’s way of trying to get the bad or toxic contaminants out of the body. Diarrhea is another early symptom that your dog has consumed something that he shouldn’t have. Always withhold food in a dog that has vomiting or diarrhea. He will need water to stay hydrated but you may need to take his food away so he doesn’t make himself sicker. When we have the stomach flu, we know enough not to eat a big meal. But your dog doesn’t understand the need to let his system heal. All dogs go through bouts of vomiting or diarrhea, but when that comes with inappetence and lethargy, we in the veterinary world really begin to worry. Early diagnosis and possible fluid therapy are best to get your canine companion to feel better. Once clinical signs begin to manifest we have fewer options and the toxicity may become a severe emergency. Bloodwork can also give us a picture of what is going on inside your dog. In a true emergency, it is best to contact Animal Poison Control or Pet Poison Helpline and have a case number opened. Your local veterinarian can continue to seek help through that case number. You can call the number as you drive your dog to the vet but do yourself a favor and invest in that service. They even have a mobile app. Emergency veterinarians deal with more poisoning cases than the average vet. However the SPCA has set up a special hotline to be utilized in emergency cases, and that is all they do. I suppose you could liken it to going to a pediatrician or a cardiologist for your child’s heart condition. I would rather pay the expert and get the information quicker. All in all, be cautious what human foods you feed your pets. One wrong snack or accident could be deadly! And, always remember to put all dangerous items behind locked doors to keep your home safe and dog accident proof!